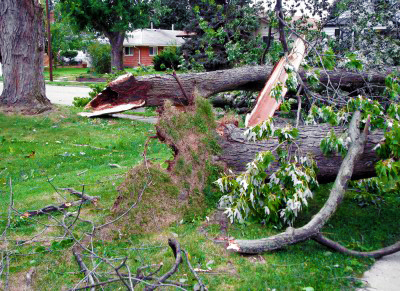 Post Hurricane Irene: Neighbor’s tree falls on your property – whose responsibilty? In the wake of Hurricane Irene, the Washington DC area remains littered with downed trees, limbs and branches. Wood Acres is busy helping with the cleanup. We’re sorry to say that many stately, old trees were destroyed. Fortunately, resulting injuries or deaths weren’t as many as feared in the aftermath of Hurricane Irene which struck this past weekend here. Many people ask, “What if a neighbor’s tree fell on my property? It’s their tree, shouldn’t they be responsible for the cleanup and damage?”. ?The area jurisdictions are stating that?toppled trees on private property would not be removed by the counties or the District and trees that have fallen on private property are the responsibility of the property owner. If you have a toppled tree – whether yours or your neighbor’s – call your own insurance company and a private tree removal service, like Wood Acres Tree Specialists. The County?s Office of Consumer Protection advises homeowners to deal with established businesses only. Beware of out-of-the-area tree crews going door to door with chainsaws. Many are unlicensed and uninsured – and can cost you more money, more damage or personal liability if something goes wrong. Consumer Protection can be reached at 240-777-3636 if you have questions. 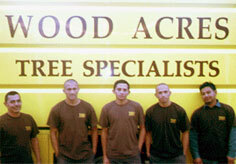 Wood Acres Tree Specialists is licensed, insured, and certified for the most dangerous tree removals and undergoes rigorous safety training. If a tree has fallen on power lines call the power company. ?If you smell gas or have a broken water main call your utility company. ?Do not touch fallen or low-hanging wires of any kind under any circumstances. Stay away from puddles with wires in or near them. Do not touch trees or other objects in contact with power lines. Hurricane season ends in November, so please hold onto your sandbags and our number for emergency tree service 1-888-464-3926 – just in case. This entry was posted in Damage, Storms, Trees & Shrubs and tagged arborists, failing trees, fallen tree limb, hurricane damage, Maryland, storm damage, tree doctor, tree service Aspen Hill md, tree service Barnesville md, tree service Beallsville md, tree service Bethesda md, tree service Boyds md, tree service Brinklow md, tree service Brookville md, tree service Burtonsville md, tree service Cabin John md, tree service Chevy Chase md, tree service Clarksburg md, tree service Colesville md, tree service Damascus md, tree service Darnestown md, tree service dc, tree service Derwood md, tree service Dickerson md, tree service Gaithersburg md, tree service Garrett Park md, tree service Germantown md, tree service Glen Echo md, tree service Hyattstown md, tree service Kensington md, tree service Laytonsville md, tree service montgomery county md, tree service Montgomery Village md, tree service Olney md, tree service Poolesville md, tree service Potomac md, tree service Rockville md, tree service Rossmoor md, tree service Sandy Spring md, tree service Silver Spring md, tree service Spencerville md, tree service Takoma Park md, tree service washington dc, tree service Washington Grove md, trees, uprooted trees, Washington DC. Bookmark the permalink.